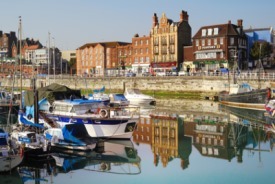 Ramsgate is a bustling harbor and historic port destination that attracts visitors year around. The small port was originally only a fishing port, but it has expanded to shipping trade since the 17th Century. In addition to being England’s only Royal Harbor, Ramesgate is also home to St. Augustine’s church, designed by Augustus Pugin.